Harley at 13, while he was still going strong! Wendy Palmer Hallenbeck graduated from Texas A&M University in 1993 not knowing quite what she wanted to do with her life. But one thing she knew for sure was that sometime and somehow dogs would be involved. Then, in 1996, she purchased a little bundle of pure energy and intelligence and everything changed from there. That little dog, a Jack Russell Terrier named Harley, was responsible for her first job in the publishing industry writing about animals and reviewing dogs products. During that time, she was taking Harley to so many obedience classes that she was eventually offered a job as an obedience instructor. 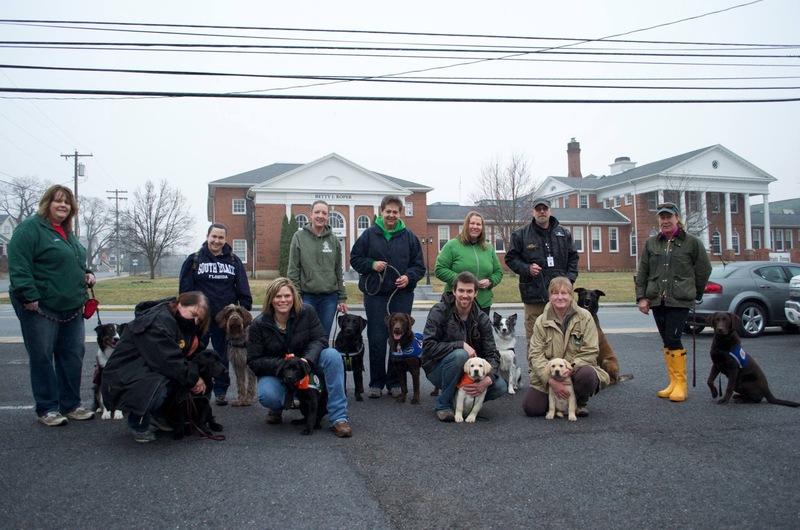 In 1999, she opened her own dog training business, Leader of the Pack Canine Academy. 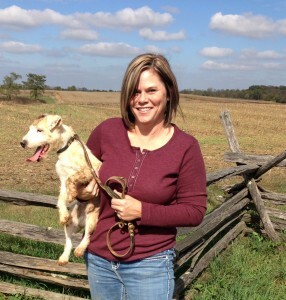 During this time, Wendy also started breeding and showing Jack Russell Terriers. After 13 years of running the board and train program and training and rehabilitating hundreds of dogs of all breeds, Harley passed away at the age of 16. Wendy lost her heart for the business that she and Harley created together and closed the Academy six months later. Shortly after, at the end of 2012, Wendy and her husband, John, relocated from the bustling area of Ft. Worth to the laid back, beautiful area near Sam Rayburn Reservoir and the Angelina National Forest known as the Piney Woods of East Texas, with the terriers in tow. Here both humans and terriers get to boat, fish, and hunt almost anytime they want. The dogs are also used for blood tracking wounded animals. As awesome as this is, Wendy knew something was missing in her life and she longed to be more involved with the dogs again in a professional manner, but wasn’t sure where she fit into that world anymore. Then a chance introduction to the world of training Diabetic Alert Dogs came, and once again, everything changed. Prayers had been answered and an idea began to form. After much research, Wendy found the Diabetes Alert Dog Alliance (DADA), and began networking with some of the best DAD trainers in the business. By utilizing the techniques learned through multiple training and mentoring programs, she was able to put the more formal aspects of scent training and service dog training to work with the terriers. The thought of working with her beloved terriers while helping improve the quality of the lives of people with disabilities is a dream come true. Since 1997, Thistle Ridge Terriers have been selectively bred for exceptional temperaments and the hunting and tracking ability they were created for. We have brought in terriers from all over the US and the world that are known for the traits that we were looking for. What we have ended up with is an intelligent, calm terrier with a nose for scent detection and a temperament to withstand all situations. You can put the stereotype aside when you think of Thistle Ridge. The terriers here are a breed of their own. They are sound, genetically healthy, proven terriers that are as loyal and eager to please as a Labrador Retriever, but as focused on a task as a terrier should be. They are small enough to take anywhere which makes them not only excellent earth dogs, but also exceptional medical alert dogs and blood tracking dogs. Thistle Ridge Terriers have always been used as therapy dogs and to set good examples in a training program for the Texas Prison System. They are exceptional, and with the proper care, attention, and the right job, will be your companion for many, many years to come. My focus on breeding has evolved over the years and every breeding is picked with the hope of breeding a sound terrier that can both hunt in the field for a variety of quarry, track a downed animal when needed, service a person with special medical alert needs, and then come in the house and hang out with the family. Temperament continues to be my main focus when choosing a dog to breed. Hunting ability follows in on a close second. While most people do not hunt with their terriers, a terrier in your home always means you have automatic pest control, and I feel that the true purpose of the breed should not be lost and will continue to focus on these characteristics. Contrary to what some believe, a good hunting terrier is not aggressive and gamey in normal life. It is focused, steady, and sound in the field and gets along well with a pack of terriers and hounds. This makes it a good pet and service dog as well because it has the ability to be under control in normal situations. Doing rescue (ie: taking in abandoned and owner-released terriers) for fifteen years has taught me a lot about what not to breed and who not to send these dogs to live with. I take the responsibility of breeding these dogs to heart and will continue to breed the best dogs I possibly can for the purposes I’ve listed. I love this breed, and couldn’t imagine life without them in my heart and home, and I am happy to share it with people that seriously want to have one as an alert dog or hunting companion. If you are ready for the challenge of a lifetime and think you are up for a pup from Thistle Ridge, please contact me. When it comes to placing our puppies in new homes, it is very important to me that each puppy goes to a family that will love and care for it as we have. I look for people who have learned as much as they can about this very unique breed and who have realistic expectations about the responsibilities and challenges that go along with ownership. Buyers must have a securely fenced yard (JRT’s love to dig – and boy, can they jump!) as well as the time to devote to training, exercising and entertaining their puppy. They must also be willing to allow the puppy to live indoors as a part of the family. Good quality nutrition and regular veterinary care are also a requirement, as is the willingness to attend puppy obedience training classes with their new family member. We supplement a high quality diet with a raw diet based on the Whole Prey Raw feeding model and will give preference to families that are willing to continue that extreme dedication to the care of their puppy. Breeding responsibly, out of love for the breed and the desire to help those in search of a medical alert dog or a dog to assist in finding wounded game, is the main focus of our kennel. We hope to continually improve the health, soundness, conformation, working ability and temperament of our puppies with each litter that we produce. Keep in mind that we do not ship dogs unless we have visited with you first and you have met your puppy. Medical alert and blood tracking dogs will not be shipped at all because they must be hand delivered and the extensive training and responsibility must be taught to the new working partner. We strongly believe that you should know what you are getting before it comes into your home and will even fly with the puppy to you (at your expense) if that’s what it takes! Due to the popularity and fame of the Jack Russell Terrier breed, many dogs have ended up in rescue and shelters. This is because people make an uniformed decision to purchase a JRT puppy based on it’s “cuteness”, without the knowledge, ability or resources to accept the responsibilities that go along with owning one of these very special, highly driven hunting dogs. For 15 years, I spent a great deal of my time helping to find loving, forever homes for these unwanted and often abused and neglected dogs. I continue to help with behavior advice and big projects when needed. If you have the desire and the ability to take a rescue dog into your heart and home, I would be delighted to help put you in touch with the right organization to assist you in the adoption process. 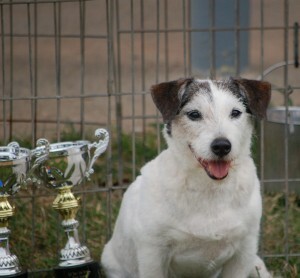 Please visit www.russellrescue.com for find out more about adopting a Jack Russell Terrier. All of our dogs are carefully screened for health problems prior to breeding, including Brucellosis testing, BAER testing, and genetic testing for Primary Lens Luxation and Spinocerebellar Ataxia as recommended by The Jack Russell Terrier Research Foundation. Puppies are vet-checked, fully vaccinated for what is appropriate at their age, de-wormed and task and temperament tested before being placed with their new owners. Puppies are guaranteed to be free of disease and in good health, and any known genetic problems will be disclosed before a purchase agreement is made. All of our show/breeding quality puppies are guaranteed as registerable with the J.R.T.C.A. (please visit this website before contacting me if you are not familiar with the registration process and have not thoroughly researched the breed! Puppies are not registered as with all breed registries. You’ll save us about ten minutes of discussion with just a few minutes of reading). If you are interested in taking the next step towards owning a quality Jack Russell Terrier puppy from Thistle Ridge, we would be glad to talk to you. Please feel free to contact us by e-mail or telephone for more information on reserving a puppy, what each program entails, estimated pricing, and a plan to get your puppy to you. We look forward to hearing from you! I constantly work to attend ongoing classes and seminars on breeding, advanced animal care, and scent work and to stay active in the professional breeding and training community. I belong to the Jack Russell Terrier Club of America, the International Association of Canine Professionals, and the Professional Pet Breeders of Texas. I am also an active member of the Jack Russell Terrier Club of America’s Breeder’s Committee; a member of the Service Dog Committee of the International Association of Canine Professionals; have been an AKC Canine Good Citizen Evaluator since 1998; and serve as the Vice President of the Diabetes Alert Dog Alliance. 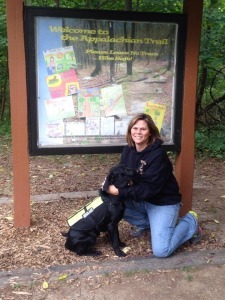 Wendy on one of her many trips to Virginia and West Virginia for advanced scent training and service dog work.